After breakfast, I take a short walk before sitting down to work at home. A few blocks take me past a side yard overgrown with privet, pokeweed and Virginia creeper; a board fence that encloses a flock of chickens; an enormous red oak tree next to a four-square house painted blue; an English cottage garden tended by an Englishwoman; and a little white house with a porch on each side. Lastly, I pass a yard with planter beds filled with lawn ornaments—swans, fawns, bunnies, a hippo couple dressed as farmers, and an angel standing in a birdbath. As I stride uphill with the sun on my left, I approach a neighborhood park from the northeast. I dodge the car careening around the sharp street corner. Then safe on the path, with oak trees towering on my right, I take a deep breath. 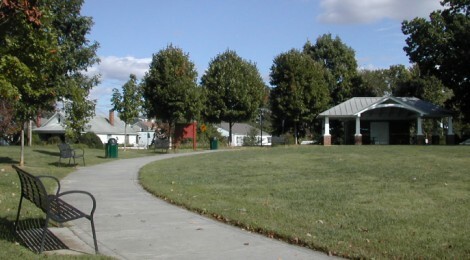 Belmont Park is one of 25 neighborhood parks in the city of Charlottesville and one of the smallest. According to the city’s Parks and Recreation Department: “The 3.1 acres of land were bought by Paul Goodloe McIntire in 1921, and he transferred the property to the city to be used as a park and playground for local citizens.” McIntire must have bought the land from the real estate developer of Belmont, who reserved it in 1891 as a recreation space. Nearly square, about 350 by 400 feet, the park occupies a hill that slopes gently down all four sides to a street. Each street is bordered by small houses of one or two stories. The scale is domestic, and the ambience is quiet. The view in all directions is open, with a range of wooded hills to the southeast, one of which is Monticello, the home of Thomas Jefferson. Planted in grass and trees, with concrete paths and play equipment, Belmont Park resembles a green square, such as those created in European and American cities from the seventeenth to nineteenth centuries. The residential squares of London are a precedent in size and shape (Leicester, laid out in 1635; Bloomsbury, 1665; St. James’s, 1684; Grosvener, 1695; and Bedford, 1775). In the United States, Louisburg Square (1826) in Boston and Gramercy Park (1832) in New York are precedents. Closer to home, the squares of Savannah (1733) are a little smaller at 315 by 270 feet. Rittenhouse Square in Philadephia (1682) is larger, at about 530 feet on a side. But all these examples are densely built up around the edges. The major design characteristic of the New England green is its openness. By framing it with single family houses with well-proportioned, gardened side yards, the effect is one of permeability of space through and around the frame without loss of design unity. Except for a bed of yellow daylilies along the west side, and a mound of tulips and daffodils in the southeast corner, the park has no flowers. It has no statue, fountain, or other monumental furniture. There is no fence or wall. And unlike the courthouse green and many urban squares, there is no public building to focus attention. Belmont Park does have playground equipment, an asphalt basketball court, and a pad with blue tubes that spray water in summer for children to play in. These are scattered amid the greenery, which is mainly oak trees of various sizes and species. The oldest and biggest are white oaks that may be more than a century old—in 1891, this area was called “The Grove.” There are also dogwoods and redbuds, some newly planted magnolias, and a few cherry trees. The only formal feature in the park is the flattened summit of the hill, a grassy field with an oval concrete walk. Young maple trees and light metal benches border the outside of the Oval, with a brick pavilion at one end and swings at the other. The pavilion looks like it dates from the 1920s, when the city took over the park. Toilets are inside, and a great Craftsman-style porch faces south at ground level. In summer, the porch often shelters a birthday party, with paper streamers and balloons tacked to the pillars, or a barbecue, with a chest of ice for drinks and smoke wafting from a portable grill. At any time of day or night, someone pushes a stroller on the curving paths, or shoots baskets, or pushes a child on a swing, or plays fetch with a dog. I have seen people fly radio-controlled model airplanes in the Oval, or lie on the grass and read. I once saw an obese woman stand like a life-size Venus of Willendorf, as she watched a child on the jungle gym. Though I leave the house by myself, and though I stick to the perimeter, I am never alone. Other people walk the same square loop, clockwise or counter. Some loopers are determined, dressed in track suits and pumping their arms. Others perambulate as if they had all the time in the world. I am of this faction. We say “Good morning” and exclaim on the weather. Day after day, in our wide-open cloister, we commune with the sky and briefly with each other. People walk their dogs and hold little plastic bags to collect what the city calls “pet waste.” Or they run, with the dogs trotting alongside. A man who lives across the street from me has a jet black pug named Coal. Another man named Frank rolls into the park in a motorized wheelchair with his chow named Charley. With thick brown fur frizzed like a judge’s wig and blue tongue dangling, Charley moves slowly on hot days. A woman named Tracy, whose house borders the park, has two greyhounds. Daisy and Scanner are ghostly thin, ash-pale, and eerily silent, but affectionate for all that. They were rescued, she says, from the racetrack. Dan, a lean, white-haired man and former home builder, has an elderly white hound with a lump on her hind leg. As we chat, she moans—not in pain, but to say it’s time to move on. The park has a thriving population of gray squirrels. Their nests dot the branches of the oak trees, high overhead. On the ground, the squirrels scurry and scamper, hurry and hop. They defy gravity as they cling to the bark of tree trunks. They tiptoe on slender branches and leap across a gap. They chase each other in dizzy, aerial circles. With their fluffy tails, white bellies and beady eyes, the squirrels are miniature acrobats, half-crazed by abundance, the vast number of acorns dropped by the oaks. One morning, as I approach the southeast corner, a young man approaches at the same moment. He has an Airedale on a leash and a little boy on a bicycle with no pedals. The boy’s feet reach the ground, where they steady him or run. I slow to allow this family group to pass. But the three individuals veer in all directions, halt, backtrack, and trip over each other like a hyperactive amoeba. Before I know what is happening, I too become entangled, and we lurch along the concrete path. The young man mumbles an apology, the little boy stares at me, and the Airedale dashes away from my hand. One fine evening in August, while the sky is still light, a large group of people gather in the Oval. A clothesline is strung from a corner of the pavilion to a tent, and beside the tent is parked a van filled with sound equipment. Capes, robes and an all-purpose veil drape the clothesline. A café table and chairs, a bench, and a few other props litter the ground. Some people sit or lie on the grass, while others more formally dressed stand and speak. There is live music. I linger at the edge of the spectacle and hear lines of Shakespeare. It is a play—the Hamner Theater from nearby Afton, Virginia is performing Much Ado About Nothing. Outrageous colors of clouds in ragged bars and banks, like paint thrown up on a scrim, but on a cosmic scale—splashes of rose, tomato, flaming gold and tangerine—while the sky is a translucent panel of contrasting shades—azure, pistachio, teal and turquoise. It is a psychedelic poster by Peter Max. Even as I walk, the sun sinks and colors shift. In the ten minutes it takes to loop the park, they fade. The leaves hang on some trees into November, so we have two months of fall foliage—russet, canary, crimson and copper. Bundled against a brisk wind, I pick up the pace. Dry leaves rustle overhead and skitter across the unkempt grass.